Available now from your local bookstore or from the publisher, Crandall, Dostie & Douglass Books. Call the publisher toll free at 877-679-6119 or click here to order from the publisher’s website. Many people are distressed by the topic of race, but few know how to talk about it. Parker and Chambers caution us, “With so much ‘happening’ around race, yet so little spoken about race, the topic takes on a forbidden air.” Our worst fear is that confronting racial issues will lead us to anger, misunderstanding or even violence. Dialogue offers a solution. How do we begin that dialogue? The Anti-Racist Cookbook offers effective, practical answers. Conversations about race are key to solving America’s racial inequities and building truly inclusive communities, workplaces and schools. The Anti-Racist Cookbook gives ordinary people ways to initiate such conversations. The authors reveal insights from their lengthy experience as facilitators of cross-race discussions. Research shows that conversations about race among diverse individuals reduce ignorance, prejudice and anger, and deepen cross-race relationships. 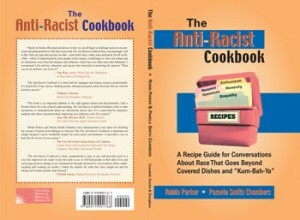 The Anti-Racist Cookbook offers an easy-to-use guide for talking about what has been called “the hardest topic to discuss in our society. Creating meaningful cross-race conversations will help make real this country’s fundamental principles of justice, equality, opportunity and racial inclusion for all. The Anti-Racist Cookbook turns talk into action through conversational recipes and intervention strategies that can positively change the climate for diversity where people live and work. Parker and Chambers take this difficult topic and teach valuable lessons of hope and change. Through provocative exercises like an analysis of the Cinderella fairy tale, or examining societal rules of denial, readers find wholly new ways to think about race and race relations. 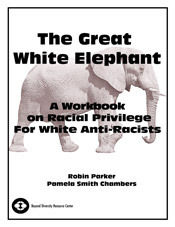 The workbook offers a practical and engaging foundation on racial privilege, and a resource that stimulates thinking and encourages readers to become active participants in the solution to one of the thorniest issues confronting our workplaces, schools, and communities. Call 856 235-2664 for discounts on large purchases. Refunds for damaged books only. Damaged books must be returned for refund.